A 230-volt incandescent light bulb with a medium-sized E27 (Edison 27 millimeter) male screw base. The filament is visible as the mostly horizontal line between the vertical supply wires. An SEM image of the tungsten filament of an incandescent light bulb. Incandescent bulbs are much less efficient than other types of electric lighting; incandescent bulbs convert less than 5% of the energy they use into visible light, with standard light bulbs averaging about 2.2%. The remaining energy is converted into heat. The luminous efficacy of a typical incandescent bulb for 120 V operation is 16 lumens per watt, compared with 60 lm/W for a compact fluorescent bulb or 150 lm/W for some white LED lamps. Some applications of the incandescent bulb (such as heat lamps) deliberately use the heat generated by the filament. Such applications include incubators, brooding boxes for poultry, heat lights for reptile tanks, infrared heating for industrial heating and drying processes, lava lamps, and the Easy-Bake Oven toy. Incandescent bulbs typically have short lifetimes compared with other types of lighting; around 1,000 hours for home light bulbs versus typically 10,000 hours for compact fluorescents and 30,000 hours for lighting LEDs. Incandescent bulbs have been replaced in many applications by other types of electric light, such as fluorescent lamps, compact fluorescent lamps (CFL), cold cathode fluorescent lamps (CCFL), high-intensity discharge lamps, and light-emitting diode lamps (LED). Some jurisdictions, such as the European Union, China, Canada and United States, are in the process[needs update] of phasing out the use of incandescent light bulbs while others, including Colombia, Mexico, Cuba, Argentina and Brazil, have prohibited them already. Historian Thomas Hughes has attributed Edison's success to his development of an entire, integrated system of electric lighting. The lamp was a small component in his system of electric lighting, and no more critical to its effective functioning than the Edison Jumbo generator, the Edison main and feeder, and the parallel-distribution system. Other inventors with generators and incandescent lamps, and with comparable ingenuity and excellence, have long been forgotten because their creators did not preside over their introduction in a system of lighting. In 1761 Ebenezer Kinnersley demonstrated heating a wire to incandescence. In 1802, Humphry Davy used what he described as "a battery of immense size", consisting of 2,000 cells housed in the basement of the Royal Institution of Great Britain, to create an incandescent light by passing the current through a thin strip of platinum, chosen because the metal had an extremely high melting point. It was not bright enough nor did it last long enough to be practical, but it was the precedent behind the efforts of scores of experimenters over the next 75 years. Over the first three-quarters of the 19th century, many experimenters worked with various combinations of platinum or iridium wires, carbon rods, and evacuated or semi-evacuated enclosures. Many of these devices were demonstrated and some were patented. In 1835, James Bowman Lindsay demonstrated a constant electric light at a public meeting in Dundee, Scotland. He stated that he could "read a book at a distance of one and a half feet". Lindsay, a lecturer at the Watt Institution in Dundee, Scotland, at the time, had developed a light that was not combustible, created no smoke or smell and was less expensive to produce than Davy's platinum-dependent bulb. However, having perfected the device to his own satisfaction, he turned to the problem of wireless telegraphy and did not develop the electric light any further. His claims are not well documented, although he is credited in Challoner et al. with being the inventor of the "Incandescent Light Bulb". In 1838, Belgian lithographer Marcellin Jobard invented an incandescent light bulb with a vacuum atmosphere using a carbon filament. In 1840, British scientist Warren de la Rue enclosed a coiled platinum filament in a vacuum tube and passed an electric current through it. The design was based on the concept that the high melting point of platinum would allow it to operate at high temperatures and that the evacuated chamber would contain fewer gas molecules to react with the platinum, improving its longevity. Although a workable design, the cost of the platinum made it impractical for commercial use. In 1841, Frederick de Moleyns of England was granted the first patent for an incandescent lamp, with a design using platinum wires contained within a vacuum bulb. He also used carbon. In 1845, American John W. Starr acquired a patent for his incandescent light bulb involving the use of carbon filaments. He died shortly after obtaining the patent, and his invention was never produced commercially. Little else is known about him. In 1859, Moses G. Farmer built an electric incandescent light bulb using a platinum filament. He later patented a light bulb which was purchased by Thomas Edison. 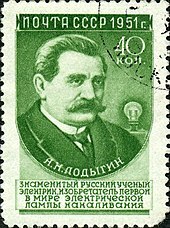 In 1872, Russian Alexander Lodygin invented an incandescent light bulb and obtained a Russian patent in 1874. He used as a burner two carbon rods of diminished section in a glass receiver, hermetically sealed, and filled with nitrogen, electrically arranged so that the current could be passed to the second carbon when the first had been consumed. Later he lived in the US, changed his name to Alexander de Lodyguine and applied and obtained patents for incandescent lamps having chromium, iridium, rhodium, ruthenium, osmium, molybdenum and tungsten filaments, and a bulb using a molybdenum filament was demonstrated at the world fair of 1900 in Paris. On 24 July 1874, a Canadian patent was filed by Henry Woodward and Mathew Evans for a lamp consisting of carbon rods mounted in a nitrogen-filled glass cylinder. They were unsuccessful at commercializing their lamp, and sold rights to their patent (U.S. Patent 0,181,613) to Thomas Edison in 1879. Heinrich Göbel in 1893 claimed he had designed the first incandescent light bulb in 1854, with a thin carbonized bamboo filament of high resistance, platinum lead-in wires in an all-glass envelope, and a high vacuum. Judges of four courts raised doubts about the alleged Göbel anticipation, but there was never a decision in a final hearing due to the expiry date of Edison's patent. A research work published 2007 concluded that the story of the Göbel lamps in the 1850s is a legend. 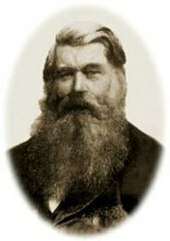 Joseph Swan (1828–1914) was a British physicist and chemist. In 1850, he began working with carbonized paper filaments in an evacuated glass bulb. By 1860, he was able to demonstrate a working device but the lack of a good vacuum and an adequate supply of electricity resulted in a short lifetime for the bulb and an inefficient source of light. By the mid-1870s better pumps became available, and Swan returned to his experiments. With the help of Charles Stearn, an expert on vacuum pumps, in 1878, Swan developed a method of processing that avoided the early bulb blackening. This received a British Patent in 1880. [dubious – discuss] On 18 December 1878, a lamp using a slender carbon rod was shown at a meeting of the Newcastle Chemical Society, and Swan gave a working demonstration at their meeting on 17 January 1879. It was also shown to 700 who attended a meeting of the Literary and Philosophical Society of Newcastle upon Tyne on 3 February 1879. These lamps used a carbon rod from an arc lamp rather than a slender filament. Thus they had low resistance and required very large conductors to supply the necessary current, so they were not commercially practical, although they did furnish a demonstration of the possibilities of incandescent lighting with relatively high vacuum, a carbon conductor, and platinum lead-in wires. This bulb lasted about 40 hours. Swan then turned his attention to producing a better carbon filament and the means of attaching its ends. He devised a method of treating cotton to produce 'parchmentised thread' in the early 1880s and obtained British Patent 4933 that same year. From this year he began installing light bulbs in homes and landmarks in England. His house, Underhill, Low Fell, Gateshead, was the first in the world to be lit by a lightbulb and also the first house in the world to be lit by hydroelectric power. In 1878 the home of Lord Armstrong at Cragside was also among the first houses to be lit by electricity. In the early 1880s he had started his company. In 1881, the Savoy Theatre in the City of Westminster, London was lit by Swan incandescent lightbulbs, which was the first theatre, and the first public building in the world, to be lit entirely by electricity. The first street in the world to be lit by an incandescent lightbulb was Mosley Street, Newcastle upon Tyne, United Kingdom. It was lit by Joseph Swan's incandescent lamp on 3 February 1879. Thomas Edison began serious research into developing a practical incandescent lamp in 1878. Edison filed his first patent application for "Improvement In Electric Lights" on 14 October 1878. After many experiments, first with carbon in the early 1880s and then with platinum and other metals, in the end Edison returned to a carbon filament. The first successful test was on 22 October 1879, and lasted 13.5 hours. Edison continued to improve this design and by 4 November 1879, filed for a US patent for an electric lamp using "a carbon filament or strip coiled and connected ... to platina contact wires." Although the patent described several ways of creating the carbon filament including using "cotton and linen thread, wood splints, papers coiled in various ways," Edison and his team later discovered that a carbonized bamboo filament could last more than 1200 hours. In 1880, the Oregon Railroad and Navigation Company steamer, Columbia, became the first application for Edison's incandescent electric lamps (it was also the first ship to use a dynamo). Albon Man, a New York lawyer, started Electro-Dynamic Light Company in 1878 to exploit his patents and those of William Sawyer. Weeks later the United States Electric Lighting Company was organized. This company didn't make their first commercial installation of incandescent lamps until the fall of 1880 at the Mercantile Safe Deposit Company in New York City, about six months after the Edison incandescent lamps had been installed on the Columbia. Hiram S. Maxim was the chief engineer at the United States Electric Lighting Company. Lewis Latimer, employed at the time by Edison, developed an improved method of heat-treating carbon filaments which reduced breakage and allowed them to be molded into novel shapes, such as the characteristic "M" shape of Maxim filaments. On 17 January 1882, Latimer received a patent for the "Process of Manufacturing Carbons", an improved method for the production of light bulb filaments, which was purchased by the United States Electric Light Company. Latimer patented other improvements such as a better way of attaching filaments to their wire supports. In Britain, the Edison and Swan companies merged into the Edison and Swan United Electric Company (later known as Ediswan, and ultimately incorporated into Thorn Lighting Ltd). Edison was initially against this combination, but after Swan sued him and won, Edison was eventually forced to cooperate, and the merger was made. Eventually, Edison acquired all of Swan's interest in the company. Swan sold his US patent rights to the Brush Electric Company in June 1882. The United States Patent Office gave a ruling 8 October 1883, that Edison's patents were based on the prior art of William Sawyer and were invalid. Litigation continued for a number of years. Eventually on 6 October 1889, a judge ruled that Edison's electric light improvement claim for "a filament of carbon of high resistance" was valid. In 1896 Italian inventor Arturo Malignani (1865–1939) patented an evacuation method for mass production, which allowed obtaining economic bulbs lasting 800 hours. The patent was acquired by Edison in 1898. Hungarian advertising of the Tungsram-bulb from 1906. 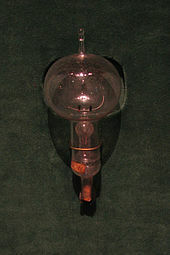 This was the first light bulb that used a filament made from tungsten instead of carbon. The inscription reads: wire lamp with a drawn wire – indestructible. 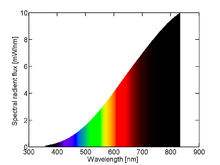 Spectrum of an incandescent lamp at 2200K, showing most of its emission as invisible infrared light. 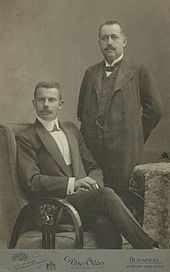 On 13 December 1904, Hungarian Sándor Just and Croatian Franjo Hanaman were granted a Hungarian patent (No. 34541) for a tungsten filament lamp that lasted longer and gave brighter light than the carbon filament. 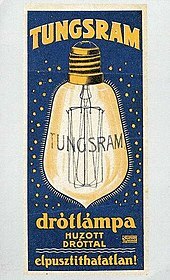 Tungsten filament lamps were first marketed by the Hungarian company Tungsram in 1904. This type is often called Tungsram-bulbs in many European countries. 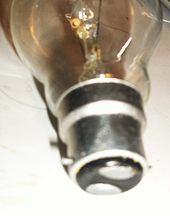 Filling a bulb with an inert gas such as argon or nitrogen slows down the evaporation of the tungsten filament compared to operating it in a vacuum. This allows for greater temperatures and therefore greater efficacy with less reduction in filament life. In 1906, William D. Coolidge developed a method of making "ductile tungsten" from sintered tungsten which could be made into filaments while working for General Electric Company. By 1911 General Electric began selling incandescent light bulbs with ductile tungsten wire. In 1917, Burnie Lee Benbow was granted a patent for inventing the coiled coil filament. In 1921, Junichi Miura created the first double-coil bulb using a coiled coil tungsten filament while working for Hakunetsusha (a predecessor of Toshiba). At the time, machinery to mass-produce coiled coil filaments did not exist. Hakunetsusha developed a method to mass-produce coiled coil filaments by 1936. Between 1924 and the outbreak of the Second World War, the Phoebus cartel attempted to fix prices and sales quotas for bulb manufacturers outside of North America. In 1925, Marvin Pipkin, an American chemist, patented a process for frosting the inside of lamp bulbs without weakening them, and in 1947, he patented a process for coating the inside of lamps with silica. In 1930, Hungarian Imre Bródy filled lamps with krypton gas rather than argon, and designed a process to obtain krypton from air. Production of krypton filled lamps based on his invention started at Ajka in 1937, in a factory co-designed by Polányi and Hungarian-born physicist Egon Orowan. Consumption of incandescent light bulbs grew rapidly in the US. In 1885, an estimated 300,000 general lighting service lamps were sold, all with carbon filaments. When tungsten filaments were introduced, about 50 million lamp sockets existed in the US. In 1914, 88.5 million lamps were used, (only 15% with carbon filaments), and by 1945, annual sales of lamps were 795 million (more than 5 lamps per person per year). Of the power consumed by typical incandescent light bulbs, 95% or more is converted into heat rather than visible light. Other electrical light sources are more effective. Luminous efficacy of a light source may be defined in two ways. The radiant luminous efficacy (LER) is the ratio of the visible light flux emitted (the luminous flux) to the total power radiated over all wavelengths. The source luminous efficacy (LES) is the ratio of the visible light flux emitted (the luminous flux) to the total power input to the source, such as a lamp. Visible light is measured in lumens, a unit which is defined in part by the differing sensitivity of the human eye to different wavelengths of light. Not all wavelengths of visible electromagnetic energy are equally effective at stimulating the human eye; the luminous efficacy of radiant energy (LER) is a measure of how well the distribution of energy matches the perception of the eye. The units of luminous efficacy are "lumens per watt" (lpw). The maximum LER possible is 683 lm/W for monochromatic green light at 555 nanometers wavelength, the peak sensitivity of the human eye. The luminous efficiency is defined as the ratio of the luminous efficacy to the theoretical maximum luminous efficacy of 683 lpw, and, as for luminous efficacy, is of two types, radiant luminous efficiency (LFR) and source luminous efficacy (LFS). The chart below lists values of overall luminous efficacy and efficiency for several types of general service, 120-volt, 1000-hour lifespan incandescent bulb, and several idealized light sources. The values for the incandescent bulbs are source efficiencies and efficacies. The values for the ideal sources are radiant efficiencies and efficacies. A similar chart in the article on luminous efficacy compares a broader array of light sources to one another. The spectrum emitted by a blackbody radiator at temperatures of incandescent bulbs does not match the sensitivity characteristics of the human eye. Most of the radiation is not in the range of wavelengths to which the eye is sensitive. Tungsten filaments radiate mostly infrared radiation at temperatures where they remain solid – below 3,695 K (3,422 °C; 6,191 °F). Donald L. Klipstein explains it this way: "An ideal thermal radiator produces visible light most efficiently at temperatures around 6,300 °C (6,600 K; 11,400 °F). Even at this high temperature, a lot of the radiation is either infrared or ultraviolet, and the theoretical luminous efficacy (LER) is 95 lumens per watt." No known material can be used as a filament at this ideal temperature, which is hotter than the sun's surface. An upper limit for incandescent lamp luminous efficacy (LER) is around 52 lumens per watt, the theoretical value emitted by tungsten at its melting point. Although inefficient, incandescent light bulbs have an advantage in applications where accurate color reproduction is important, since the continuous blackbody spectrum emitted from an incandescent light-bulb filament yields near-perfect color rendition, with a color rendering index of 100 (the best possible). White-balancing is still required to avoid too "warm" or "cool" colors, but this is a simple process that requires only the color temperature in kelvins as input for modern, digital visual reproduction equipment such as video or still cameras unless it is completely automated. The color-rendering performance of incandescent lights cannot be matched by LEDs or fluorescent lights, although they can offer satisfactory performance for non-critical applications such as home lighting. White-balancing such lights is therefore more complicated, requiring additional adjustments to reduce for example green-magenta color casts, and even when properly white-balanced, the color reproduction will not be perfect. 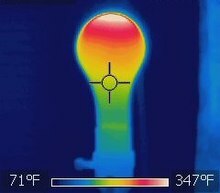 Thermal image of an incandescent bulb. 71–347 °F = 22–175 °C. For a given quantity of light, an incandescent light bulb produces more heat (and thus consumes more power) than a fluorescent lamp. In buildings where air conditioning is used, incandescent lamps' heat output increases load on the air conditioning system. While heat from lights will reduce the need for running a building's heating system, in general a heating system can provide the same amount of heat at a lower cost than incandescent lights. Halogen incandescent lamps have higher efficacy, which will allow a halogen light to use less power to produce the same amount of light compared to a non-halogen incandescent light. Halogen lights produce a more constant light-output over time, without much dimming. There are many non-incandescent light sources, such as the fluorescent lamp, high-intensity discharge lamps and LED lamps, which have higher luminous efficiency, and some have been designed to be retrofitted in fixtures for incandescent lights. These devices produce light by luminescence. These lamps produce discrete spectral lines and do not have the broad "tail" of invisible infrared emissions. By careful selection of which electron energy level transitions are used, and fluorescent coatings which modify the spectral distribution, the spectrum emitted can be tuned to mimic the appearance of incandescent sources, or other different color temperatures of white light. Due to the discrete spectral lines rather than a continuous spectrum, the light is not ideal for applications such as photography and cinematography. The initial cost of an incandescent bulb is small compared to the cost of the energy it uses over its lifetime. Incandescent bulbs have a shorter life than most other lighting, an important factor if replacement is inconvenient or expensive. Some types of lamp, including incandescent and fluorescent, emit less light as they age; this may be an inconvenience, or may reduce effective lifetime due to lamp replacement before total failure. A comparison of incandescent lamp operating cost with other light sources must include illumination requirements, cost of the lamp and labor cost to replace lamps (taking into account effective lamp lifetime), cost of electricity used, effect of lamp operation on heating and air conditioning systems. When used for lighting in houses and commercial buildings, the energy lost to heat can significantly increase the energy required by a building's air conditioning system. During the heating season heat produced by the bulbs is not wasted, although in most cases it is more cost effective to obtain heat from the heating system. Regardless, over the course of a year a more efficient lighting system saves energy in nearly all climates. Since incandescent light bulbs use more energy than alternatives such as CFLs and LED lamps, many governments have introduced measures to ban their use, by setting minimum efficacy standards higher than can be achieved by incandescent lamps. Measures to ban light bulbs have been implemented in the European Union, the United States, Russia, Brazil, Argentina, Canada and Australia, among others. In Europe, the EC has calculated that the ban contributes 5 to 10 billion euros to the economy and saves 40 TWh of electricity every year, translating in CO2 emission reductions of 15 million tonnes. In the US, federal law has scheduled the most common incandescent light bulbs to be phased out by 2014, to be replaced with more energy-efficient light bulbs. Traditional incandescent light bulbs were phased out in Australia in November 2009. Objections to banning the use of incandescent light bulbs include the higher initial cost of alternatives and lower quality of light of fluorescent lamps. Some people have concerns about the health effects of fluorescent lamps. However, even though they contain mercury, the environmental performance of CFLs is much better than that of light bulbs, mostly because they consume much less energy and therefore strongly reduce the environmental impact of power production. LED lamps are even more efficient, and are free of mercury. They are regarded as the best solution in terms of cost effectiveness and robustness. Some research has been carried out to improve the efficacy of commercial incandescent lamps. In 2007, the consumer lighting division of General Electric announced a "high efficiency incandescent" (HEI) lamp project, which they claimed would ultimately be as much as four times more efficient than current incandescents, although their initial production goal was to be approximately twice as efficient. The HEI program was terminated in 2008 due to slow progress. US Department of Energy research at Sandia National Laboratories initially indicated the potential for dramatically improved efficiency from a photonic lattice filament. However, later work indicated that initially promising results were in error. Prompted by legislation in various countries mandating increased bulb efficiency, new "hybrid" incandescent bulbs have been introduced by Philips. The "Halogena Energy Saver" incandescents can produce about 23 lm/W; about 30 percent more efficient than traditional incandescents, by using a reflective capsule to reflect formerly wasted infrared radiation back to the filament from which it can be re-emitted as visible light. This concept was pioneered by Duro-Test in 1980 with a commercial product that produced 29.8 lm/W. More advanced reflectors based on interference filters or photonic crystals can theoretically result in higher efficiency, up to a limit of about 270 lm/W (40% of the maximum efficacy possible). Laboratory proof-of-concept experiments have produced as much as 45 lm/W, approaching the efficacy of compact fluorescent bulbs. Incandescent light bulbs consist of an air-tight glass enclosure (the envelope, or bulb) with a filament of tungsten wire inside the bulb, through which an electric current is passed. Contact wires and a base with two (or more) conductors provide electrical connections to the filament. Incandescent light bulbs usually contain a stem or glass mount anchored to the bulb's base that allows the electrical contacts to run through the envelope without air or gas leaks. Small wires embedded in the stem in turn support the filament and its lead wires. An electric current heats the filament to typically 2,000 to 3,300 K (3,140 to 5,480 °F), well below tungsten's melting point of 3,695 K (6,191 °F). Filament temperatures depend on the filament type, shape, size, and amount of current drawn. The heated filament emits light that approximates a continuous spectrum. The useful part of the emitted energy is visible light, but most energy is given off as heat in the near-infrared wavelengths. Three-way light bulbs have two filaments and three conducting contacts in their bases. The filaments share a common ground, and can be lit separately or together. Common wattages include 30–70–100, 50–100–150, and 100–200–300, with the first two numbers referring to the individual filaments, and the third giving the combined wattage. Most light bulbs have either clear or coated glass. The coated glass bulbs have a white powdery substance on the inside called kaolin. Kaolin, or kaolinite, is a white, chalky clay in a very fine powder form, that is blown in and electrostatically deposited on the interior of the bulb. It diffuses the light emitted from the filament, producing a more gentle and evenly distributed light. Manufacturers may add pigments to the kaolin to adjust the characteristics of the final light emitted from the bulb. Kaolin diffused bulbs are used extensively in interior lighting because of their comparatively gentle light. Other kinds of colored bulbs are also made, including the various colors used for "party bulbs", Christmas tree lights and other decorative lighting. These are created by coloring the glass with a dopant; which is often a metal like cobalt (blue) or chromium (green). Neodymium-containing glass is sometimes used to provide a more natural-appearing light. Many arrangements of electrical contacts are used. Large lamps may have a screw base (one or more contacts at the tip, one at the shell) or a bayonet base (one or more contacts on the base, shell used as a contact or used only as a mechanical support). Some tubular lamps have an electrical contact at either end. Miniature lamps may have a wedge base and wire contacts, and some automotive and special purpose lamps have screw terminals for connection to wires. Contacts in the lamp socket allow the electric current to pass through the base to the filament. Power ratings for incandescent light bulbs range from about 0.1 watt to about 10,000 watts. 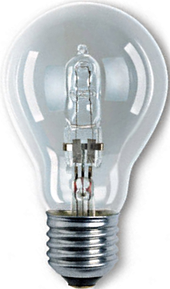 The glass bulb of a general service lamp can reach temperatures between 200 and 260 °C (392 and 500 °F). Lamps intended for high power operation or used for heating purposes will have envelopes made of hard glass or fused quartz. Most modern bulbs are filled with an inert gas to reduce evaporation of the filament and prevent its oxidation. The gas is at a pressure of about 70 kPa (0.7 atm). The role of the gas is to prevent evaporation of the filament, but the fill must be chosen carefully to avoid introducing significant heat losses. For these properties, chemical inertness and high atomic or molecular weight is desirable. The presence of gas molecules knocks the liberated tungsten atoms back to the filament, reducing its evaporation and allowing it to be operated at higher temperature without reducing its life (or, for operating at the same temperature, prolongs the filament life). On the other hand, the presence of the gas leads to heat loss from the filament—and therefore efficiency loss due to reduced incandescence—by heat conduction and heat convection. Early lamps, and some small modern lamps used only a vacuum to protect the filament from oxygen. The vacuum increases evaporation of the filament but eliminates two modes of heat loss. Vacuum, used in small lamps. Provides best thermal insulation of the filament but does not protect against its evaporation. Used also in larger lamps where the outer bulb surface temperature has to be limited. Krypton, which is more advantageous than argon due to its higher atomic weight and lower thermal conductivity (which also allows use of smaller bulbs), but its use is hindered by much higher cost, confining it mostly to smaller-size bulbs. Krypton mixed with xenon, where xenon improves the gas properties further due to its higher atomic weight. Its use is however limited by its very high cost. The improvements by using xenon are modest in comparison to its cost. Hydrogen, in special flashing lamps where rapid filament cooling is required; its high thermal conductivity is exploited here. The gas fill must be free of traces of water. In the presence of the hot filament, water reacts with tungsten forming tungsten trioxide and atomic hydrogen. The oxide deposits on the bulb inner surface and reacts with hydrogen, decomposing to metallic tungsten and water. Water then cycles back to the filament. This greatly accelerates the bulb blackening, in comparison with evaporation-only. The gas layer close to the filament (called the Langmuir layer) is stagnant, with heat transfer occurring only by conduction. Only at some distance does convection occur to carry heat to the bulb's envelope. The orientation of the filament influences efficiency. Gas flow parallel to the filament, e.g., a vertically oriented bulb with vertical (or axial) filament, reduces convective losses. The efficiency of the lamp increases with a larger filament diameter. 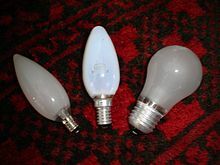 Thin-filament, low-power bulbs benefit less from a fill gas, so are often only evacuated. 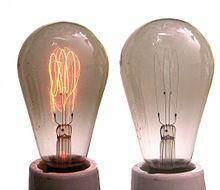 Early lightbulbs with carbon filaments also used carbon monoxide, nitrogen, or mercury vapor. However, carbon filaments operate at lower temperatures than tungsten ones, so the effect of the fill gas was not significant as the heat losses offset any benefits. Early bulbs were laboriously assembled by hand. After automatic machinery was developed, the cost of bulbs fell. Until 1910, when Libbey's Westlake machine went into production, bulbs were generally produced by a team of three workers (two gatherers and a master gaffer) blowing the bulbs into wooden or cast-iron molds, coated with a paste. Around 150 bulbs per hour were produced by the hand-blowing process in the 1880s at Corning Glass Works. The Westlake machine, developed by Libbey Glass, was based on an adaptation of the Owens-Libbey bottle-blowing machine. Corning Glass Works soon began developing competing automated bulb-blowing machines, the first of which to be used in production was the E-Machine. Corning continued developing automated bulb-production machines, installing the Ribbon Machine in 1926 in its Wellsboro, Pennsylvania factory. The Ribbon Machine surpassed any previous attempts to automate bulb production and was used to produce incandescent bulbs into the 21st century. The inventor, William Woods, along with his colleague at Corning Glass Works, David E. Gray, had created a machine that by 1939 was turning out 1,000 bulbs per minute. The Ribbon Machine works by passing a continuous ribbon of glass along a conveyor belt, heated in a furnace, and then blown by precisely aligned air nozzles through holes in the conveyor belt into molds. Thus the glass bulbs or envelopes are created. A typical machine of this sort can produce anywhere from 50,000 to 120,000 bulbs per hour, depending on the size of the bulb. By the 1970s, 15 ribbon machines installed in factories around the world produced the entire supply of incandescent bulbs. The filament and its supports are assembled on a glass stem, which is then fused to the bulb. The air is pumped out of the bulb, and the evacuation tube in the stem press is sealed by a flame. The bulb is then inserted into the lamp base, and the whole assembly tested. The 2016 closing of Osram-Sylvania's Wellsboro, Pennsylvania plant meant that one of the last remaining ribbon machines in the United States was shut down. The first successful light bulb filaments were made of carbon (from carbonized paper or bamboo). Early carbon filaments had a negative temperature coefficient of resistance—as they got hotter, their electrical resistance decreased. This made the lamp sensitive to fluctuations in the power supply, since a small increase of voltage would cause the filament to heat up, reducing its resistance and causing it to draw even more power and heat even further. In the "flashing" process, carbon filaments were heated by current passing through them while in an evacuated vessel containing hydrocarbon vapor (usually gasoline). The carbon deposited on the filament by this treatment improved the uniformity and strength of filaments as well as their efficiency. A metallized or "graphitized" filament was first heated in a high-temperature oven before flashing and lamp assembly. This transformed the carbon into graphite, which further strengthened and smoothed the filament. This also changed the filament to have a positive temperature coefficient, like a metallic conductor, and helped stabilize the lamp's power consumption, temperature and light output against minor variations in supply voltage. 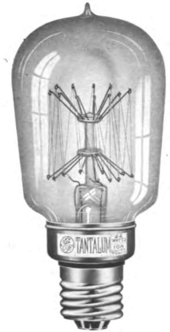 In 1902, the Siemens company developed a tantalum lamp filament. These lamps were more efficient than even graphitized carbon filaments and could operate at higher temperatures. Since tantalum metal has a lower resistivity than carbon, the tantalum lamp filament was quite long and required multiple internal supports. The metal filament had the property of gradually shortening in use; the filaments were installed with large loops that tightened in use. This made lamps in use for several hundred hours quite fragile. Metal filaments had the property of breaking and re-welding, though this would usually decrease resistance and shorten the life of the filament. General Electric bought the rights to use tantalum filaments and produced them in the US until 1913. From 1898 to around 1905, osmium was also used as a lamp filament in Europe, and the metal was so expensive that used broken lamps could be returned for partial credit. It could not be made for 110 V or 220 V so several lamps were wired in series for use on standard voltage circuits. In 1904, the tungsten filament was developed by Croatian inventors Franjo Hanaman and Alexander Just. Tungsten metal was initially not available in a form that allowed it to be drawn into fine wires. Filaments made from sintered tungsten powder were quite fragile. By 1910, a process was developed by William D. Coolidge at General Electric for production of a ductile form of tungsten. The process required pressing tungsten powder into bars, then several steps of sintering, swaging, and then wire drawing. It was found that very pure tungsten formed filaments that sagged in use, and that a very small "doping" treatment with potassium, silicon, and aluminium oxides at the level of a few hundred parts per million greatly improved the life and durability of the tungsten filaments. To improve the efficiency of the lamp, the filament usually consists of multiple coils of coiled fine wire, also known as a 'coiled coil'. 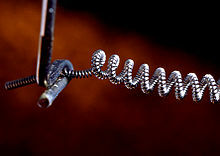 Light bulbs using coiled coil filaments are sometimes referred to as 'double-coil bulbs'. For a 60-watt 120-volt lamp, the uncoiled length of the tungsten filament is usually 22.8 inches (580 mm), and the filament diameter is 0.0018 inches (0.046 mm). The advantage of the coiled coil is that evaporation of the tungsten filament is at the rate of a tungsten cylinder having a diameter equal to that of the coiled coil. The coiled-coil filament evaporates more slowly than a straight filament of the same surface area and light-emitting power. As a result, the filament can then run hotter, which results in a more efficient light source, while reducing the evaporation so that the filament will last longer than a straight filament at the same temperature. 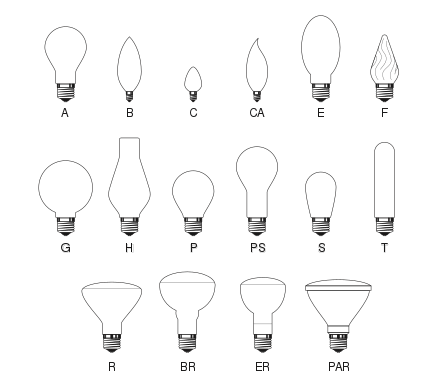 There are several different shapes of filament used in lamps, with differing characteristics. Manufacturers designate the types with codes such as C-6, CC-6, C-2V, CC-2V, C-8, CC-88, C-2F, CC-2F, C-Bar, C-Bar-6, C-8I, C-2R, CC-2R, and Axial. Filament of a burnt-out 50-watt incandescent lightbulb in an SEM in stereoscopic mode, presented as an anaglyph image. Filament of a 50-watt incandescent lightbulb in an SEM in stereoscopic mode, presented as an anaglyph image. Electrical filaments are also used in hot cathodes of fluorescent lamps and vacuum tubes as a source of electrons or in vacuum tubes to heat an electron-emitting electrode. One of the problems of the standard electric light bulb is filament notching due to evaporation of the filament. Small variations in resistivity along the filament cause "hot spots" to form at points of higher resistivity; a variation of diameter of only 1% will cause a 25% reduction in service life. These hot spots evaporate faster than the rest of the filament, which increases the resistance at that point—this creates a positive feedback that ends in the familiar tiny gap in an otherwise healthy-looking filament. Irving Langmuir found that an inert gas, instead of vacuum, would retard evaporation. General service incandescent light bulbs over about 25 watts in rating are now filled with a mixture of mostly argon and some nitrogen, or sometimes krypton. Lamps operated on direct current develop random stairstep irregularities on the filament surface which may cut lifespan in half compared to AC operation; different alloys of tungsten and rhenium can be used to counteract the effect. Since a filament breaking in a gas-filled bulb can form an electric arc, which may spread between the terminals and draw very heavy current, intentionally thin lead-in wires or more elaborate protection devices are therefore often used as fuses built into the light bulb. More nitrogen is used in higher-voltage lamps to reduce the possibility of arcing. While inert gas reduces filament evaporation, it also conducts heat from the filament, thereby cooling the filament and reducing efficiency. At constant pressure and temperature, the thermal conductivity of a gas depends upon the molecular weight of the gas and the cross sectional area of the gas molecules. Higher molecular weight gasses have lower thermal conductivity, because both the molecular weight is higher and also the cross sectional area is higher. Xenon gas improves efficiency because of its high molecular weight, but is also more expensive, so its use is limited to smaller lamps. During ordinary operation, the tungsten of the filament evaporates; hotter, more-efficient filaments evaporate faster. Because of this, the lifetime of a filament lamp is a trade-off between efficiency and longevity. The trade-off is typically set to provide a lifetime of several hundred to 2,000 hours for lamps used for general illumination. Theatrical, photographic, and projection lamps may have a useful life of only a few hours, trading life expectancy for high output in a compact form. Long-life general service lamps have lower efficiency but are used where the cost of changing the lamp is high compared to the value of energy used. If a light bulb envelope leaks, the hot tungsten filament reacts with air, yielding an aerosol of brown tungsten nitride, brown tungsten dioxide, violet-blue tungsten pentoxide, and yellow tungsten trioxide that then deposits on the nearby surfaces or the bulb interior. In a conventional lamp, the evaporated tungsten eventually condenses on the inner surface of the glass envelope, darkening it. For bulbs that contain a vacuum, the darkening is uniform across the entire surface of the envelope. When a filling of inert gas is used, the evaporated tungsten is carried in the thermal convection currents of the gas, depositing preferentially on the uppermost part of the envelope and blackening just that portion of the envelope. An incandescent lamp that gives 93% or less of its initial light output at 75% of its rated life is regarded as unsatisfactory, when tested according to IEC Publication 60064. Light loss is due to filament evaporation and bulb blackening. Study of the problem of bulb blackening led to the discovery of the Edison effect, thermionic emission and invention of the vacuum tube. A very small amount of water vapor inside a light bulb can significantly affect lamp darkening. Water vapor dissociates into hydrogen and oxygen at the hot filament. The oxygen attacks the tungsten metal, and the resulting tungsten oxide particles travel to cooler parts of the lamp. Hydrogen from water vapor reduces the oxide, reforming water vapor and continuing this water cycle. The equivalent of a drop of water distributed over 500,000 lamps will significantly increase darkening. Small amounts of substances such as zirconium are placed within the lamp as a getter to react with any oxygen that may bake out of the lamp components during operation. Close-up of a tungsten filament inside a halogen lamp. The two ring-shaped structures left and right are filament supports. The halogen lamp reduces uneven evaporation of the filament and eliminates darkening of the envelope by filling the lamp with a halogen gas at low pressure, rather than an inert gas. 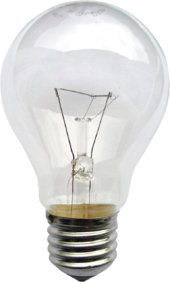 The halogen cycle increases the lifetime of the bulb and prevents its darkening by redepositing tungsten from the inside of the bulb back onto the filament. The halogen lamp can operate its filament at a higher temperature than a standard gas filled lamp of similar power without loss of operating life. Such bulbs are much smaller than normal incandescent bulbs, and are widely used where intense illumination is needed in a limited space. Fiber-optic lamps for optical microscopy is one typical application. A variation of the incandescent lamp did not use a hot wire filament, but instead used an arc struck on a spherical bead electrode to produce heat. The electrode then became incandescent, with the arc contributing little to the light produced. Such lamps were used for projection or illumination for scientific instruments such as microscopes. These arc lamps ran on relatively low voltages and incorporated tungsten filaments to start ionization within the envelope. They provided the intense concentrated light of an arc lamp but were easier to operate. Developed around 1915, these lamps were displaced by mercury and xenon arc lamps. Incandescent lamps are nearly pure resistive loads with a power factor of 1. This means the actual power consumed (in watts) and the apparent power (in volt-amperes) are equal. Incandescent light bulbs are usually marketed according to the electrical power consumed. This is measured in watts and depends mainly on the resistance of the filament, which in turn depends mainly on the filament's length, thickness, and material. For two bulbs of the same voltage, type, color, and clarity, the higher-powered bulb gives more light. The table shows the approximate typical output, in lumens, of standard incandescent light bulbs at various powers. Light output of a 230 V version is usually slightly less than that of a 120 V version. The lower current (higher voltage) filament is thinner and has to be operated at a slightly lower temperature for same life expectancy, and that reduces energy efficiency. The lumen values for "soft white" bulbs will generally be slightly lower than for clear bulbs at the same power. The actual resistance of the filament is temperature dependent. The cold resistance of tungsten-filament lamps is about 1/15 the hot-filament resistance when the lamp is operating. For example, a 100-watt, 120-volt lamp has a resistance of 144 ohms when lit, but the cold resistance is much lower (about 9.5 ohms). [c] Since incandescent lamps are resistive loads, simple phase-control TRIAC dimmers can be used to control brightness. Electrical contacts may carry a "T" rating symbol indicating that they are designed to control circuits with the high inrush current characteristic of tungsten lamps. For a 100-watt, 120-volt general-service lamp, the current stabilizes in about 0.10 seconds, and the lamp reaches 90% of its full brightness after about 0.13 seconds. Incandescent light bulbs come in a range of shapes and sizes. Incandescent light bulbs come in a range of shapes and sizes. The names of the shapes vary somewhat from region to regions. Many of these shapes have a designation consisting of one or more letters followed by one or more numbers, e.g. A55 or PAR38. The letters represent the shape of the bulb. The numbers represent the maximum diameter, either in ​1⁄8 of an inch, or in millimeters, depending on the shape and the region. For example, 63 mm reflectors are designated R63, but in the US, they are known as R20 (2.5 in). However, in both regions, a PAR38 reflector is known as PAR38. ANSI C79.1-2002, IS 14897:2000 and JIS C 7710:1988 cover a common terminology for bulb shapes. Light emitted in (nearly) all directions. Available either clear or frosted. Lamps greater than 200 watts. lamps used in chandeliers, etc. Smaller candle-sized bulbs may use a smaller socket. Reflective coating inside the bulb directs light forward. Flood types (FL) spread light. Spot types (SP) concentrate the light. Reflector (R) bulbs put approximately double the amount of light (foot-candles) on the front central area as General Service (A) of same wattage. Parabolic aluminized reflector (PAR) bulbs control light more precisely. They produce about four times the concentrated light intensity of general service (A), and are used in recessed and track lighting. Weatherproof casings are available for outdoor spot and flood fixtures. Available in numerous spot and flood beam spreads. Like all light bulbs, the number represents the diameter of the bulb in ​1⁄8 of an inch. Therefore, a PAR 16 is 2 in in diameter, a PAR 20 is 2.5 in in diameter, PAR 30 is 3.75 in and a PAR 38 is 4.75 in in diameter. Multifaceted reflector bulbs are usually smaller in size and run at a lower voltage, often 12 V.
"HIR" is a GE designation for a lamp with an infrared reflective coating. Since less heat escapes, the filament burns hotter and more efficiently. The Osram designation for a similar coating is "IRC". Very small lamps may have the filament support wires extended through the base of the lamp, and can be directly soldered to a printed circuit board for connections. Some reflector-type lamps include screw terminals for connection of wires. Most lamps have metal bases that fit in a socket to support the lamp and conduct current to the filament wires. In the late 19th century, manufacturers introduced a multitude of incompatible lamp bases. General Electric introduced standard base sizes for tungsten incandescent lamps under the Mazda trademark in 1909. This standard was soon adopted across the US, and the Mazda name was used by many manufacturers under license through 1945. Today most incandescent lamps for general lighting service use an Edison screw in candelabra, intermediate, or standard or mogul sizes, or double contact bayonet base. Technical standards for lamp bases include ANSI standard C81.67 and IEC standard 60061-1 for common commercial lamp sizes, to ensure interchangeablitity between different manufacturer's products. Bayonet base lamps are frequently used in automotive lamps to resist loosening due to vibration. A bipin base is often used for halogen or reflector lamps. Lamp bases may be secured to the bulb with a cement, or by mechanical crimping to indentations molded into the glass bulb. Miniature lamps used for some automotive lamps or decorative lamps have wedge bases that have a partial plastic or even completely glass base. In this case, the wires wrap around to the outside of the bulb, where they press against the contacts in the socket. Miniature Christmas bulbs use a plastic wedge base as well. Lamps intended for use in optical systems such as film projectors, microscope illuminators, or stage lighting instruments have bases with alignment features so that the filament is positioned accurately within the optical system. 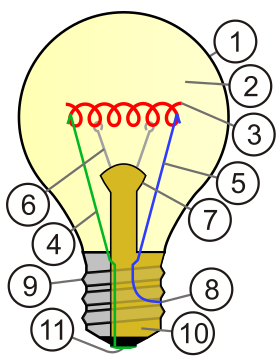 A screw-base lamp may have a random orientation of the filament when the lamp is installed in the socket. Incandescent lamps are very sensitive to changes in the supply voltage. These characteristics are of great practical and economic importance. This means that a 5% reduction in operating voltage will more than double the life of the bulb, at the expense of reducing its light output by about 16%. This may be a very acceptable trade off for a light bulb that is in a difficult-to-access location (for example, traffic lights or fixtures hung from high ceilings). Long-life bulbs take advantage of this trade-off. Since the value of the electric power they consume is much more than the value of the lamp, general service lamps emphasize efficiency over long operating life. The objective is to minimize the cost of light, not the cost of lamps. Early bulbs had a life of up to 2500 hours, but in 1924 a cartel agreed to limit life to 1000 hours. When this was exposed in 1953, General Electric and other leading American manufacturers were banned from limiting the life. The relationships above are valid for only a few percent change of voltage around rated conditions, but they do indicate that a lamp operated at much lower than rated voltage could last for hundreds of times longer than at rated conditions, albeit with greatly reduced light output. The "Centennial Light" is a light bulb that is accepted by the Guinness Book of World Records as having been burning almost continuously at a fire station in Livermore, California, since 1901. However, the bulb emits the equivalent light of a four watt bulb. A similar story can be told of a 40-watt bulb in Texas that has been illuminated since 21 September 1908. It once resided in an opera house where notable celebrities stopped to take in its glow, and was moved to an area museum in 1977. In flood lamps used for photographic lighting, the tradeoff is made in the other direction. Compared to general-service bulbs, for the same power, these bulbs produce far more light, and (more importantly) light at a higher color temperature, at the expense of greatly reduced life (which may be as short as two hours for a type P1 lamp). The upper temperature limit for the filament is the melting point of the metal. Tungsten is the metal with the highest melting point, 3,695 K (6,191 °F). A 50-hour-life projection bulb, for instance, is designed to operate only 50 °C (122 °F) below that melting point. Such a lamp may achieve up to 22 lumens per watt, compared with 17.5 for a 750-hour general service lamp. Lamps designed for different voltages have different luminous efficacy. For example, a 100-watt, 120-volt lamp will produce about 17.1 lumens per watt. A lamp with the same rated lifetime but designed for 230 V would produce only around 12.8 lumens per watt, and a similar lamp designed for 30 volts (train lighting) would produce as much as 19.8 lumens per watt. Lower voltage lamps have a thicker filament, for the same power rating. They can run hotter for the same lifetime before the filament evaporates. The wires used to support the filament make it mechanically stronger, but remove heat, creating another tradeoff between efficiency and long life. Many general-service 120-volt lamps use no additional support wires, but lamps designed for "rough service" or "vibration service" may have as many as five. Low-voltage lamps have filaments made of heavier wire and do not require additional support wires. Very low voltages are inefficient since the lead wires would conduct too much heat away from the filament, so the practical lower limit for incandescent lamps is 1.5 volts. Very long filaments for high voltages are fragile, and lamp bases become more difficult to insulate, so lamps for illumination are not made with rated voltages over 300 volts. Some infrared heating elements are made for higher voltages, but these use tubular bulbs with widely separated terminals. The Centennial Light is the longest-lasting light bulb in the world. Various lighting spectra as viewed in a diffraction grating. Upper left: fluorescent lamp, upper right: incandescent bulb, lower left: white LED, lower right: candle flame. ^ Many of the above lamps are illustrated and described in Houston, Edwin J. & Kennely, A. E. (1896). Electric Incandescent Lighting. New York: The W. J. Johnston Company. pp. 18–42 – via Internet Archive. 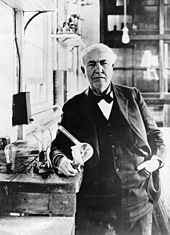 ^ Edison's research team was aware of the large negative temperature coefficient of resistance of possible lamp filament materials and worked extensively during the period 1878–1879 on devising an automatic regulator or ballast to stabilize current. It wasn't until 1879 that it was realized a self-limiting lamp could be built. See Friedel, Robert & Israel, Paul (2010). Edison's Electric Light: The Art of Invention (Revised ed.). The Johns Hopkins University Press. pp. 29–31. ISBN 978-0-8018-9482-4. Archived from the original on 6 December 2017. Retrieved 3 July 2018. ^ a b c Instead of a 26 mm E26 screw used for 110 V, European 230 V light bulbs use a 27 mm (E27) screw. Likewise, European candle-flame bulbs use E14 instead of E12. See also Edison screw types. ^ a b Size measured in millimeters. See also A-series light bulb. ^ a b c d e Keefe, T.J. (2007). "The Nature of Light". Archived from the original on 2012-04-23. Retrieved 2007-11-05. ^ Nicola Armaroli, Vincenzo Balzani, Towards an electricity-powered world. In: Energy and Environmental Science 4, (2011), 3193-3222, doi:10.1039/c1ee01249e. ^ Vincenzo Balzani, Giacomo Bergamini, Paola Ceroni, Light: A Very Peculiar Reactant and Product. In: Angewandte Chemie International Edition 54, Issue 39, (2015), 11320–11337, doi:10.1002/anie.201502325. ^ "Storey's guide to raising chickens" Archived 28 January 2017 at the Wayback Machine Damerow, Gail. Storey Publishing, LLC; 2nd edition (12 January 1995), ISBN 978-1-58017-325-4. page 221. Retrieved 10 November 2009. ^ "277 Secrets Your Snake and Lizard Wants you to Know Unusual and useful Information for Snake Owners & Snake Lovers" Archived 29 January 2017 at the Wayback Machine Cooper,Paulette. Ten Speed Press (1 March 2004), ISBN 978-1-58008-035-4. Page 161. Retrieved 10 November 2009. ^ "El peligro de los bombillos ahorradores". El Espectador. Archived from the original on 14 November 2014. Retrieved 22 October 2014. ^ "Informe técnico preliminar - Estándar mínimo de eficiencia energética" (PDF). Ministry of Energy - Chile. Archived (PDF) from the original on 29 August 2013. Retrieved 22 October 2014. ^ Friedel & Israel (2010), p. 115–117. ^ Hughes, Thomas P. (1977). "Edison's method". In Pickett, W. B. Technology at the Turning Point. San Francisco: San Francisco Press. pp. 5–22. ^ Hughes, Thomas P. (2004). American Genesis: A Century of Invention and Technological Enthusiasm (2nd ed.). Chicago: University of Chicago Press. ISBN 978-0-22635-927-4. ^ Josephson, Matthew (1959). Edison: a biography. McGraw Hill. ISBN 0-471-54806-5. ^ Blake-Coleman, B. C. (Barrie Charles) (1992). Copper Wire and Electrical Conductors – The Shaping of a Technology. Harwood Academic Publishers. p. 127. ISBN 3-7186-5200-5. Archived from the original on 6 December 2017. ^ Jones, Bence (2011). The Royal Institution: Its Founder and Its First Professors. Cambridge University Press. p. 278. ISBN 1108037704. ^ "Popular Science Monthly (Mar-Apr 1879)". Wiki Source. Archived from the original on 10 September 2015. Retrieved 1 November 2015. ^ Houston & Kennely (1896), chapter 2. ^ a b Challoner, Jack; et al. (2009). 1001 Inventions That Changed The World. Hauppauge NY: Barrons Educational Series. p. 305. ISBN 978-1844036110. ^ Friedel & Israel (2010), p. 91. ^ Houston & Kennely (1896), p. 24. ^ Friedel & Israel (2010), p. 7. ^ Charles D. Wrege J.W. Starr: Cincinnati's Forgotten Genius, Cincinnati Historical Society Bulletin 34 (Summer 1976): 102–120. Retrieved 2010 February 16. ^ Derry, T.K. ; Williams, Trevor (1960). A Short History of Technology. Oxford University Press. ISBN 0-486-27472-1. ^ "John Wellington Starr". Retrieved 2010 February 16. ^ Conot, Robert (1979). A Streak of Luck. New York: Seaview Books. p. 120. ISBN 0-87223-521-1. ^ Edison Electric Light Co. vs. United States Electric Lighting Co., Federal Reporter, F1, Vol. 47, 1891, p. 457. ^ "Alexander de Lodyguine - Google keresés". google.com. ^ "Patent no. 3738. Filing year 1874: Electric Light". Library and Archives Canada. Archived from the original on 19 June 2013. Retrieved 17 June 2013. ^ "Henry Woodward and Mathew Evans Lamp retrieved 2010 February 16". frognet.net. Archived from the original on 2005-02-19. ^ a b c Guarnieri, M. (2015). "Switching the Light: From Chemical to Electrical". IEEE Industrial Electronics Magazine. 9 (3): 44–47. doi:10.1109/MIE.2015.2454038. ^ a b Swan, K R (1946). 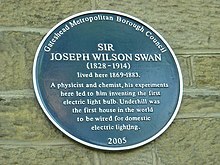 Sir Joseph Swan and the Invention of the Incandescent Electric Lamp. Longmans, Green and Co. pp. 21–25. ^ a b "Dec. 18, 1878: Let There Be Light — Electric Light". WIRED. 18 December 2009. Archived from the original on 21 October 2016. ^ R.C. Chirnside. Sir Joseph Wilson Swan FRS – The Literary and Philosophical Society of Newcastle upon Tyne 1979. ^ "Electric lighting". Newcastle University Library. 23 October 2013. Archived from the original on 6 June 2014. Retrieved 30 December 2016. ^ "Sir Joseph William Swan FRS (RSC National Chemical Landmark)". Blue plaque at the Literary and Philosophical Society of Newcastle, 23 Westgate Road, Newcastle upon Tyne: Wikimedia. Archived from the original on 30 December 2016. Retrieved 30 December 2016. Nearby Mosley Street was the first street in the world to be lit by such electric bulbs. ^ Burns, Elmer Ellsworth (1910). The story of great inventions. Harper & Brothers. Retrieved 12 September 2013. ^ Israel, Paul (1998). Edison: a Life of Invention. Wiley. p. 186. ^ "Thomas Edison: Original Letters and Primary Sources". Shapell Manuscript Foundation. Archived from the original on 19 January 2012. ^ Levy, Joel (2002). Really useful: the origins of everyday things. New York: Firefly Books. p. 124. ISBN 9781552976227. ^ Belyk, Robert C. (2001). Great Shipwrecks of the Pacific Coast. New York: Wiley. ISBN 0-471-38420-8. ^ Jehl, Francis (1936). Menlo Park reminiscences, Volume 2. Edison's institute. p. 564. ^ Dalton, Anthony (2011). A Long, Dangerous Coastline: Shipwreck Tales from Alaska to California. Heritage House Publishing Company. p. 63. ^ Consol. Elec. Light Co v. McKeesport Light Co, 40 F. 21 (C.C.W.D. Pa. 1889) aff'd, 159 U.S. 465, 16 S. Ct. 75, 40 L. Ed. 221 (1895). ^ Mills, Allan (June 2013). "The Nernst Lamp. Electrical Conductivity in Non-Metallic Materials". ERittenhouse. 24 (1). Archived from the original on 17 July 2013. ^ "Walther Nernst Chronology". nernst.de. Archived from the original on 22 February 2015. Retrieved 18 January 2015. ^ "The History of Tungsram" (PDF). Archived from the original (PDF) on 30 May 2005. ^ Giridharan, M. K. (2010). Electrical Systems Design. New Delhi: I. K. International. p. 25. ISBN 9789380578057. Archived from the original on 2 January 2016. Retrieved 7 June 2015. ^ "Burnie Lee Benbow". frognet. Archived from the original on 12 June 2012. Retrieved 19 February 2017. ^ "Trial Production of the World's First Double-Coil Bulb". Toshiba. TOSHIBA CORP. Archived from the original on 19 February 2017. Retrieved 19 February 2017. ^ "Ganz and Tungsram - the 20th century". Archived from the original on 30 March 2009. ^ "End of Incandescent Light Bulb". yuvaengineers.com. 23 June 2012. Archived from the original on 7 March 2017. Retrieved 7 March 2017. ^ "The Energy Efficiency of Light Bulbs Today Compared to the Past". kse-lights.co.uk. 13 February 2017. Archived from the original on 7 March 2017. Retrieved 7 March 2017. ^ a b Klipstein, Donald L. (1996). "The Great Internet Light Bulb Book, Part I". Archived from the original on 2 May 2006. Retrieved 16 April 2006. ^ "WebCite query result". webcitation.org. Archived from the original on 28 January 2013. ^ a b "WebCite query result". webcitation.org. Archived from the original on 28 January 2013. ^ Prof. Peter Lund, Helsinki University of Technology, on p. C5 in Helsingin Sanomat 23 Oct. 2007. ^ "Efficient lighting equals higher heat bills: study". CBC News. 4 March 2009. Archived from the original on 14 February 2011. ^ Anil Parekh (January 2008). "Benchmarking Home Energy Savings from Energy-Efficient Lighting" (PDF). Canada Mortgage and Housing Corporation. Archived from the original (PDF) on 30 January 2016. Retrieved 14 January 2016. ^ Nicholas A. A.Howarth, Jan Rosenow: Banning the bulb: Institutional evolution and the phased ban of incandescent lighting in Germany. In: Energy Policy 67, (2014), 737–746, doi:10.1016/j.enpol.2013.11.060. ^ Paul Davidson (16 December 2007). "It's lights out for traditional light bulbs". USA Today. Archived from the original on 26 June 2012. ^ "Phase-out of inefficient incandescent light bulbs". Think Change. Department of Climate Change and Energy Efficiency. 2 February 2011. Archived from the original on 1 May 2011. Retrieved 15 May 2011. ^ a b Leora Broydo Vestel (6 July 2009). "Incandescent Bulbs Return to the Cutting Edge". The New York Times. Archived from the original on 12 May 2011. Retrieved 6 July 2009. ^ Welz et al, Environmental impacts of lighting technologies — Life cycle assessment and sensitivity analysis. In: Environmental Impact Assessment Review 31, (2011), 334–343, doi:10.1016/j.eiar.2010.08.004. ^ Calderon et al, LED bulbs technical specification and testing procedure for solar home systems. In: Renewable and Sustainable Energy Reviews 41, (2015), 506–520, doi:10.1016/j.rser.2014.08.057. ^ a b Daley, Dan (February 2008). "Incandescent's Not-So-Dim Future". Projection, Lights & Staging News. 09 (1). Timeless Communications Corp. p. 46. Archived from the original on 6 March 2014. Retrieved 17 June 2013. 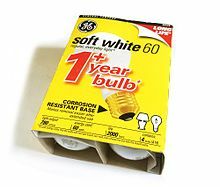 ^ "GE Announces Advancement in Incandescent Technology; New High-Efficiency Lamps Targeted for Market by 2010". Business Wire. 23 February 2007. Archived from the original on 16 May 2013. Retrieved 18 June 2013. ^ Hamilton, Tyler (22 April 2009). "Why the brightest idea needs tinkering". Toronto Star. Archived from the original on 20 June 2013. Retrieved 18 June 2013. ^ Rahim, Saqib (28 June 2010). "The Incandescent Bulb Heads Offstage After Century-Long Performance". The New York Times. Archived from the original on 18 May 2013. Retrieved 18 June 2013. ^ "Revolutionary tungsten photonic crystal could provide more power for electrical devices". Sandia National Laboratories. 7 July 2003. Archived from the original on 21 February 2013. Retrieved 18 June 2013. ^ "Prototype Heat-Mirror Tungsten Lamp". Smithsonian Museum of American History. Archived from the original on 23 December 2015. ^ "Energy Efficient Incandescent Lamp: Final Report". Lawrence Berkeley National Laboratory. April 1982. ^ a b Ilic, Ognjen (2016). "Tailoring high-temperature radiation and the resurrection of the incandescent source". Nature Nanotechnology. 11 (4): 320–4. Bibcode:2016NatNa..11..320I. doi:10.1038/nnano.2015.309. PMID 26751172. ^ Matt McGrath (12 January 2016). "New development could lead to more effective lightbulbs". BBC News. Archived from the original on 13 January 2016. ^ "Lamp Material Information Sheet – Incandescent Lamp" (PDF). Archived (PDF) from the original on 21 May 2013. Retrieved 20 May 2013. ^ a b "Argon (Ar) Properties, Uses, Applications Argon Gas and Liquid Argon". Gas Properties, Uses, Applications. Universal Industrial Gases, Inc. Archived from the original on 4 February 2012. ^ Ropp, Richard C. The Chemistry of Artificial Lighting Devices. Elsevier Science. ISBN 0080933157. Archived from the original on 6 December 2017. ^ a b c d Graham, Margaret B. W.; Shuldiner, Alec T. (2001). Corning and the craft of innovation. Oxford [England]: Oxford University Press. pp. 85–95. ISBN 0195140974. OCLC 45493270. ^ Innovations in glass. Corning, New York: Corning Museum of Glass. 1999. p. 52. ISBN 0872901467. OCLC 42012660. ^ "Light Bulb: How Products are Made". Archived from the original on September 14, 2010. ^ "Running the ribbon machine: Stories from the team". Behind the Glass. 2018-01-09. Retrieved 2018-05-14. ^ a b "The machine that lit up the world". Behind the Glass. 2017-01-27. Retrieved 2018-05-14. ^ "GE Tantalum Filament 25W of American Design". Museum of Electric Lamp Technology. Archived from the original on 13 November 2012. Retrieved 17 June 2013. ^ "The Osmium Filament Lamp". frognet.net. Archived from the original on 12 October 2008. ^ Kaštelan-Macan, Marija (2002). "Hanaman, Franjo". Leksikografski zavod Miroslav Krleža (in Croatian). Retrieved 14 June 2018. ^ "Miniature Lamps: Technical Information". Toshiba Lighting & Technology Corporation. Retrieved 25 February 2019. ^ Hunt, Robert (2001–2006). "Glass Blowing for Vacuum Devices – Lamp Autopsy". Teralab. Archived from the original on 11 March 2007. Retrieved 2 May 2007. ^ Lipstein, Don. "Premium Fill Gasses". Archived from the original on 11 October 2011. Retrieved 13 October 2011. ^ IEC 60064 Tungsten filament lamps for domestic and similar general lighting purposes. ^ "Incandescent Arc Lamps". Museum of Electric Lamp Technology. 2004. Archived from the original on 1 August 2013. Retrieved 17 June 2013. ^ "Light and Lighting Fun Facts". donklipstein.com. Archived from the original on 20 July 2013. ^ Friedel & Israel (2010), pp. 22–23. ^ "Identification Guide". KO Lighting. Archived from the original on 2 January 2016. Retrieved 18 June 2013. ^ "IS 14897 (2000): Glass Bulb Designation System for Lamps — Guide". New Delhi: Bureau of Indian Standards. pp. 1, 4. Retrieved 2018-07-03. A — A bulb shape having a spherical and [sic; end?] section that is joined to the neck by a radius that […] A60: An "A" shape bulb with a nominal major diameter of 60 mm. ^ JIS C 7710:1988 電球類ガラス管球の形式の表し方 (in Japanese). Archived from the original on 11 November 2016. Retrieved 21 March 2017. ^ "Lighting Resources". GE Lighting North America. Archived from the original on 3 July 2007. ^ "IRC Saver calculator". Osram. Archived from the original on 23 December 2008. ^ "Single-Ended Halogen Bases". Bulbster.com. Archived from the original on 19 September 2013. Retrieved 17 June 2013. ^ Krajewski, Markus (24 September 2014). "The Great Lightbulb Conspiracy". IEEE Spectrum. IEEE. Archived from the original on 6 November 2014. Retrieved 10 November 2014. ^ "Tests shine light on the secret of the Livermore light bulb". 6 February 2011. Archived from the original on 10 March 2012. ^ "Watts Up? – A parting look at lighting". Archived from the original on 7 February 2009. Wikimedia Commons has media related to Incandescent light bulbs.